Happy first day of fall my dear readers. Autumn is truly here! Finally, it’s acceptable to wear cute jumpers, layer up and even spend a day wearing nothing but warm PJ’s (and a pashmina because I'm THAT extra). I don’t know about you, but I love this time of year, especially when it comes to makeup. Catwalks did not disappoint and brands are all about AW18/19 trends: jewel tones, purples, magentas and glitters. I asked my favourite beauty bloggers about their makeup picks and boy, did they deliver. If you fancy knowing how beauty bloggers dress up their vanities and makeup bags for fall, let’s dig in shall we? To be honest, I am a little at loss naming the autumn/winter beauty trends for the upcoming season. Google offers a variety of trends, none of which feels very autumnal to me (Sorbet lips? Come on! ), so I guess I will go with the three autumn staples that help me instantly get into the fall mood. With these down, the rest will fall into place eventually! Urban Decay Naked Skin Concealer in Light Neutral - A concealer? Let me explain! I suffer from postinflammatory hyperpigmentation (and, to be fair, the aftermath of reckless sunbathing sessions of my youth, but shhh) and after a summer spent at the beach, the hyperpigmentation is clearly visible. No amount of SPF will ever prevent that completely, so I rely on the UD concealer to hide the spots while the rest of my face wears as little foundation as possible. And, I have to admit, when I bought the shade Light Neutral a year ago in France I should have known better than to get the exact match for my skin. Once the last bit of tan has faded, it is too dark for me to use. Anastasia Beverly Hills Modern Renaissance eyeshadow palette - I don´t usually like eyeshadow palettes. I get bored easily and much prefer my collection of singles all through the year, but the Modern Renaissance almost made me a convert. The shades are soft, easy to blend, stay vibrant and offer a variety of colour combinations that keep me entertained for the whole season. Essie Nail Polish in Sole Mate - The perfect deep and autumnal red. I am a huge fan of Essie nail polish in general, but this is the only polish I ever repurchased, and one that I would happily wear year after year when the evenings get chilly. 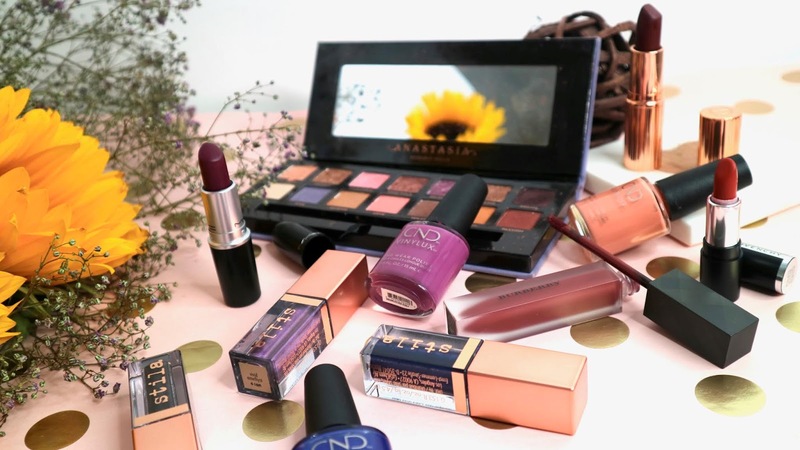 When it comes to makeup, berry tones definitely symbolise the autumn season for me. 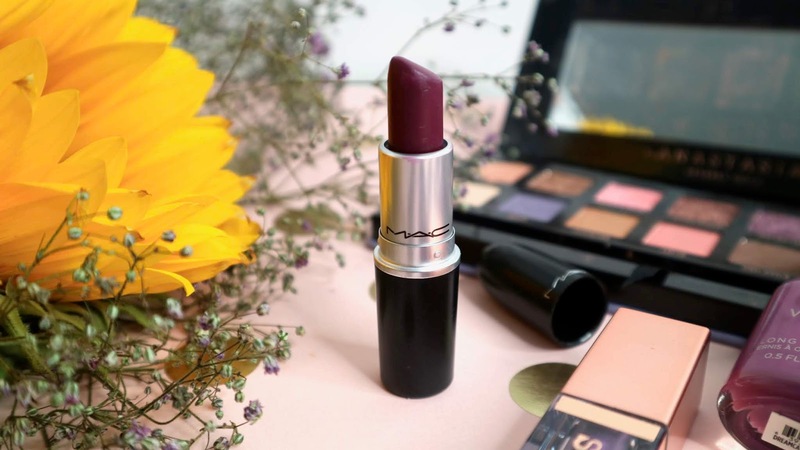 Dark reds and plums are just perfect for this time of year and one of my favourites has to be my trusted MAC "Rebel" lipstick. When I first saw it I never thought it would work with pale skin and blonde hair without making me look like a goth, but it works surprisingly well and I always get comments whenever I wear it. I think it would work well with any skin tone so next time you're near a MAC store give it a go! When autumn hits it also means I get to wear CND Shellac "Tinted Love" on my nails. I keep it only for the colder months as its a beautiful dark red mixed with a hint of plum to it. It's also very glossy and I always feel very well manicured and turned out when I wear it. My favourite fall palette has to be the Morphe The Jaclyn Hill palette. I do use it all year round but as it has lots of reds, burnt oranges and browns its especially good for autumn. 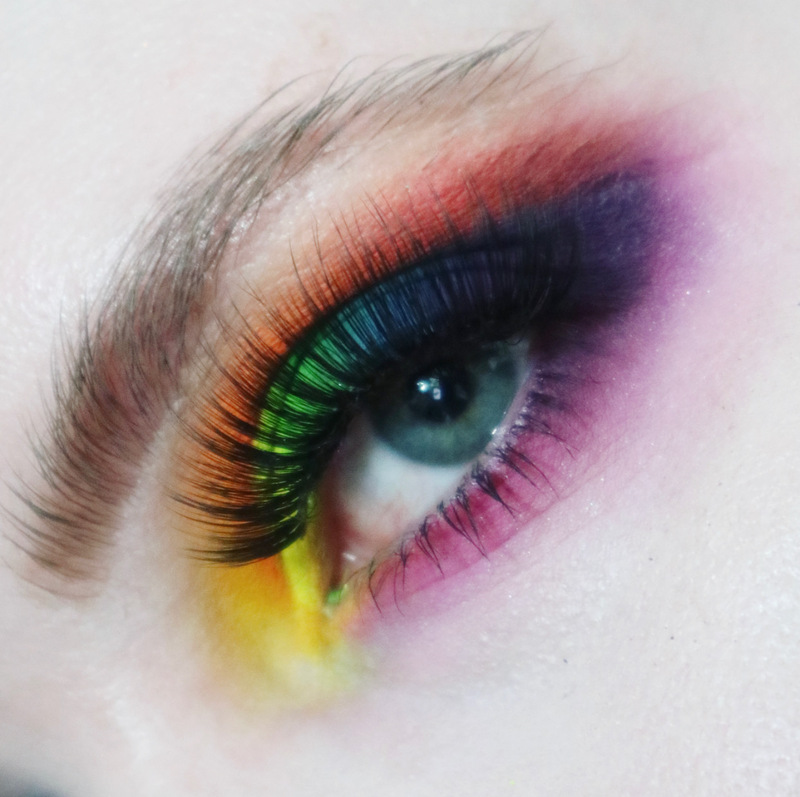 Plus with the almost blacks and bright/ green shades you could also create some amazing Halloween looks with it as well. 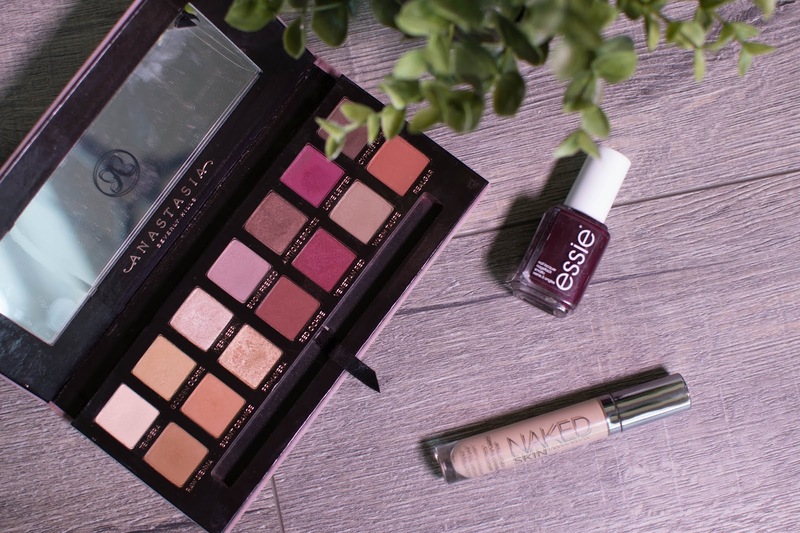 My go-to shades for autumn (already!) have been rusty tones so I have three colour products here. These sorts of browns, reds and golds really fit in with the different hues of autumn leaves and look gorgeous with the sorts of colours I like in my clothes for this time of year (burnt oranges, mustards, burgundies and so on). It might not be revolutionary, but I love this sort of look! It can be toned down with brown-toned nudes in the day or amped up with deeper colours for an evening look. First up is the Urban Decay Petite Heat Eyeshadow Palette (£26). I’m obsessed with this right now and have even tried a few all-matte looks with this, which isn’t something I usually do! 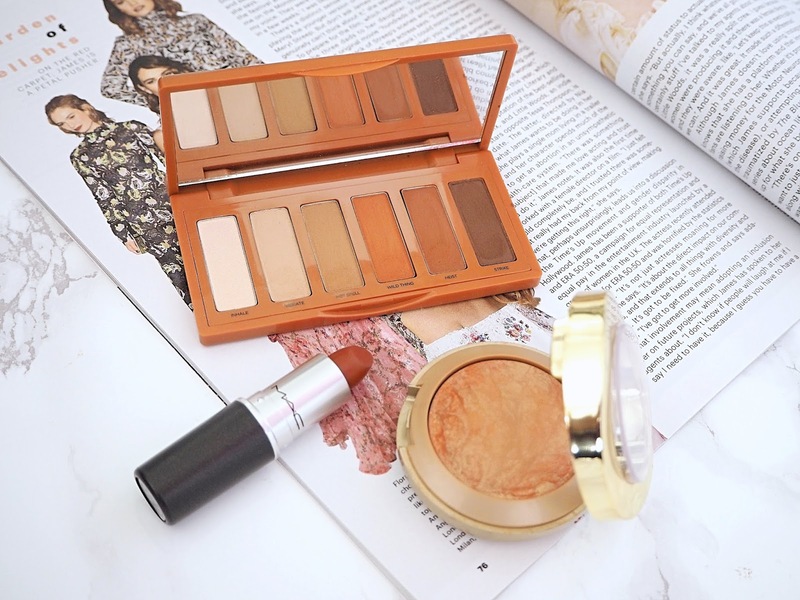 The shades are just so easy to work with and it has everything you need to create a warm-toned eye look – you can do something quite natural with it or go all out with the smoky shades. There are reds, oranges, purples and a couple of more neutral tones. On the cheeks, I really like the Milani Baked Blush in Bellissimo Bronze (£10). It’s great because it ties in my makeup looks with this sort of warm theme without overwhelming things and I think that’s why I reach for it so much around this time of year. It’s subtle and contains a sheen, adding a hint of bronzed colour to the cheeks. Finally, I’m currently obsessed with my MAC Matte Lipstick in Marrakesh (£17.50), which is just autumn in a lip colour for me. 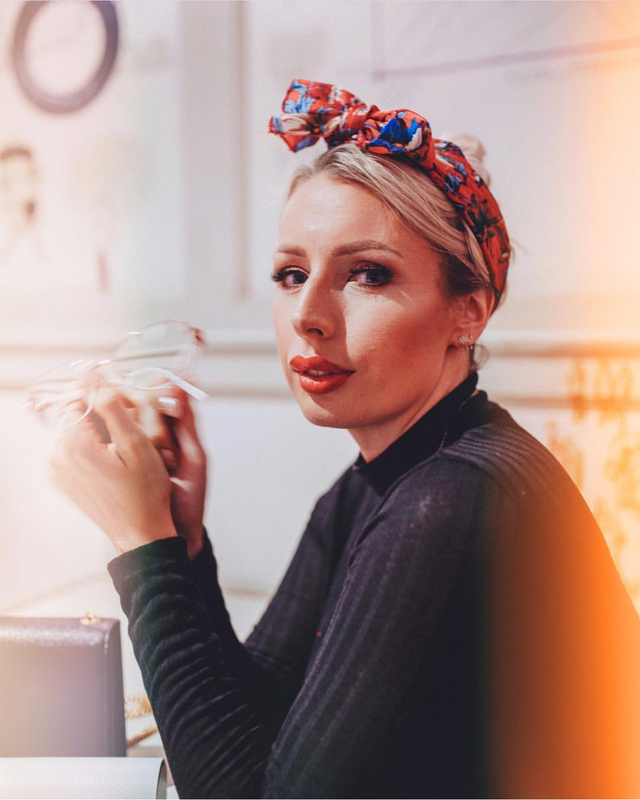 It’s hard to describe but I’d call this shade a sort of deep, spiced brown-red colour – it pairs beautifully with the rusty tones of the Urban Decay palette on the eyes. I love how comfortable and non-drying the formula is, as my lips can get a bit sore when the weather starts to go cold. For me autumn is my favourite, I love the weather, the pumpkin spiced lattes, the colours... so for me, Autumn is forever about the lips. I have been blessed with big lips that just need to be rocking a red, burgundy colour. So my top three at this time of year will forever be lipsticks. My favourite always seems to be Maybelline Divine Wine lipstick, the perfect dark red shade is just beautiful. This will be one I always go back to, time and time again. Next up is MAC D is for Danger lipstick, newer to my stash this is one I seem to reach for a lot. The shade is beautiful and again is all about the dark red vibes. Last and not least is something a little different for this year. 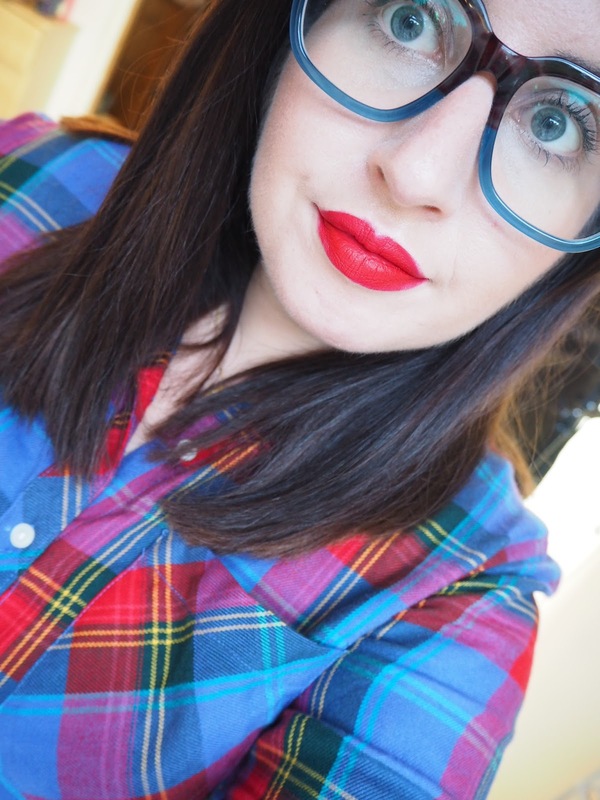 Jeffree Star’s RedRum is the perfect true red that just doesn’t budge, making this incredibly easy to wear. 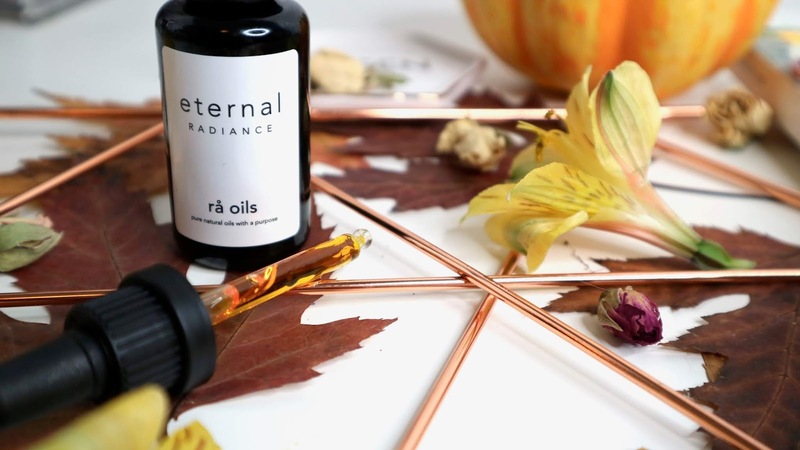 Pairing this with my favourite tartan shirt and my new short dark hair is a different take on autumn that I am loving at the moment! 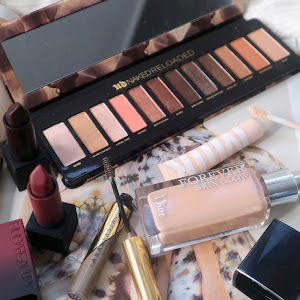 And how does fall influence my makeup picks? I’m embracing it as much as I can. The trends this year as illustrated in September’s issue of British Vogue are influenced by confidence, crazy 80s & chic 20s fashion and makeup with either bright or deep colours, jewel tones and lots of sparkles. It’s Bohemian on amphetamine - fast, a little manic and very confident. 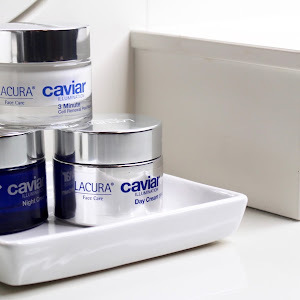 Vogue's beauty editor and MUA extraordinaire Path McGrath calls it Maximal Minimalism. Get ready for flawless skin, harsh lines, metallics, bold colours and sparkle. In the words of the genius herself, bare meets bold. The skin should be a canvas on which your bold makeup stands out. I strongly believe in Path’s way to makeup. Why be defined by caution if you can simply create? This autumn, every woman and man wearing makeup oozes the dominance and power. There’s nothing stopping us now! Anastasia Beverly Hills Norvina has been the prototype of all the fall 2018 collections. Inspired by purples and warmth from matte to foil, there are so many looks to be created with it. I personally see it more on deeper complexions where the shades would truly stand out, but don’t let that stop you my pale beauties. Norvina the child of Anastasia’s daughter and creative director, is truly stunning. Norvina’s known for her love of purples and pinks, a woman behind many Instagram trends. You can wear it down of course, but please try and go crazy. When can you if not now? Be bold my lovelies, show them who’s the boss here! The Stila hasn’t disappointed with their launch of Vivid & Vibrant fall collection. Truly gem-like shades have found its way to the Shimmer & Glow line and oh my, aren’t they spectacular? I was so lucky to attend the lunch party and I instantly fell over the heels with a few shades. My bold soulmate the Vivid Saphire* divine navy mixed with some purple makes the bold makeup in one single swipe. I experimented with catwalk cat eye and crisp line here on Instagram and fell back in love with the harshness of the line. Everyday favourite Vivid Labradorite* shows the duality of the shades more than others. In daylight, it’s greyish with some shimmer mixed in but when the lights are on it explodes with a multitude of colours and sparkle. One-step smokey eye, it’s intense and I wouldn’t dare to sheer it out. Best to only blend the edges and top with some matte powder shade for extra dimension. You have a minute or two before it sets but when it does, you’ll say goodbye to your chance for blending, so keep that in mind. And lastly (at least in my collection) the Vivid Amethyst*, a true purple with a hint of pink gold shimmer mixed in is probably the one if you’d like to go a little crazy and use it along with Vivid Saphire. I’d either just apply it in splotches for that Bohemian feel share the lid space with one going on top and other on the bottom. The choice is yours here, so use your imagination and go wild! My favourite nail polish brand did not disappoint with the launch of autumn's CND Vinylux Wild Earth collection. I was kindly gifted three beautiful shades so I'm all set for autumn. Starting with incredibly vibrant (almost a twin to Stila's Vivid Saphire!) Blue Moon* I'm currently sporting on my short nails. And with Dreamcatcher*, a beautiful purple and Spear*, the muted terracotta of dreams, I feel I'm all set for autumn. I wear Vinylux polishes exclusively as I find them super opaque and lasting the longest on my own nails. If you haven't tried them yet, grab one or two. I promise you won't look back! Lastly, lipsticks of the fall should not surprise anyone. I tend to put away the orange reds (I’ll miss you CT Tell Laura!) and nudes in favour of purples, berries and deeper reds. From everyday heroes like MAC Rebel (purple satin with some magenta thrown in) and Givenchy Le Rouge Mat in 329 Rouge Stiletto* (true red matte), my autumn lips are bold and unapologetic. The Givenchy red may be my new favourite formula as it stays put all day, even almost surviving a massive meal. It’s not as drying as other mattes I encountered either so this girl may need to go shopping (check out that sale on FeelUnique I dare ya!)! I wear deep berries whenever the mood strikes me, but I understand these statement shades may not be everyone’s Monday morning cup of tea. Both Charlotte Tilbury Glastonberry (cool toned berry) and Burberry Liquid Lip Velvet in Oxblood (deep berry) are best paired with almost nothing makeup, where they can stand out on their own. Imagine flawless and glowing, almost glassy Korean skin with a hint of mascara (glossy lids too if you’re into a little mess!) and a bold lip choice? It makes me want to purr! Or go super bold with dark smokey and lip, little gothic and empowering. Products marked with * were gifted for review consideration & some links used may be affiliate. It means I earn a teeny tiny commission each time you purchase something by clicking on the link. All commission to date has been spent on makeup/skincare shopping or updating my camera/lights equipment. 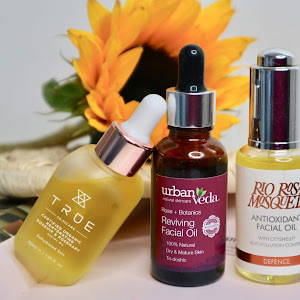 All the clicks and purchases are very much appreciated as they help me keep doing what I love most - reviewing tons and tons of makeup and skincare for you. This does not influence my opinion in any way. I’ll always relay my unbiased thoughts to my readers. Aaaah Thank you so much lovely! 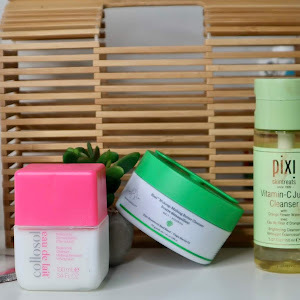 I love everyone included too - such incredible products! I love the MR palette too, especially at this time of year. Thank you for your contribution! Let’s do this again sometime! Modern Renaissance is gorgeous for autumn! Thank you for helping out with the feature! An amazing read, thank you for putting me into such great company here! I wear a pashmina too, perfect to wrap around yourself to stay warm and extra? Maybe, but we are worth it. I feel so overwhelmed with how talented friends I have! Just look at you all! I am yet to get myself an Anastasia Palette, but both Modern Renaissance, Norvina (and Soft Glam which isn't featured here) are haunting me! And Rebel is such a Autumn shade! I could not agree more about that! Go for Soft Glam if you’re unsure! Thank you! It’s just a pleasure to collaborate with so many amazing bloggers! Great makeup features! Love Autumn looks. Thank you for your contribution! And yes you were away having a fabulous time!